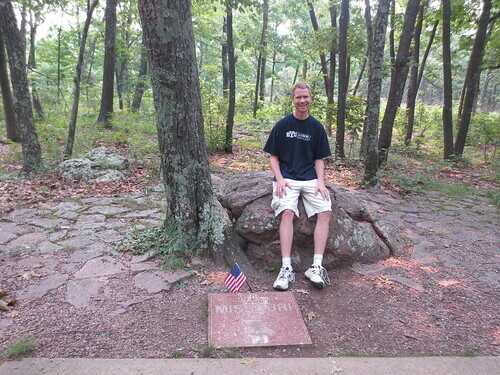 After visiting Britton Hill during a summer trip to visit family in Texas, we decided to swing past Taum Sauk, the highpoint of Missouri, on our way back to Pittsburgh. Located in the St. Francois mountains, Taum Sauk is one of the rare locations in the area that hadn't been covered by a shallow sea. It is a true mountain, formed from volcanic origins many eons ago. The mountains have been quarried and mined for many years because of their excellent ores for lead, iron and other metals. We didn't come to mine, though, we came to visit the highest point in Missouri. Taum Sauk is surrounded by Taum Sauk Mountain State Park, which features camping and hiking, but coming from Dallas, we instead chose to spend the night about an hour away in the Ozark National Scenic Riverways. The next morning, we followed highway 21/72 on a very winding road through the Ozarks, passing small towns and the occasional farm, but mostly enjoying the Mark Twain National Forest. Shortly before coming to Ironton, we reached the turn for County Route CC, the road to the summit. After a couple of miles, we came to a well-signed fork, and made the right turn on to a well-graded dirt road. We continued to climb past an observation deck to the trailhead parking area. From the parking area, the trail is a well-maintained, paved concrete path which goes about a quarter-mile through the woods to an exposed granite rock at the summit of Taum Sauk. The kids enjoyed climbing on the rock, jumping off of it, and looking for bugs while Heather and I took a couple of pictures. We didn't spend much time there, though, as we had a long drive ahead of us trying to make it back to Pittsburgh that night. On the way back to the car, we saw a side trail leading through the woods to Mina Sauk Falls, the highest waterfall in Missouri. While it was only 1.2 miles away, and would have been a nice diversion, we decided to skip that hike in the interests of time. The highpoint itself is covered in forest, and we didn't see the lookout tower, so we stopped at the observation area on our way back down the mountain to the highway. While a bit hazy, we could still see for several miles at the rolling and ancient St. Francios Mountains. If anything, our day in the Ozarks helped me see what an interesting part of the country it is, and I'd like to get back to the area again sometime.